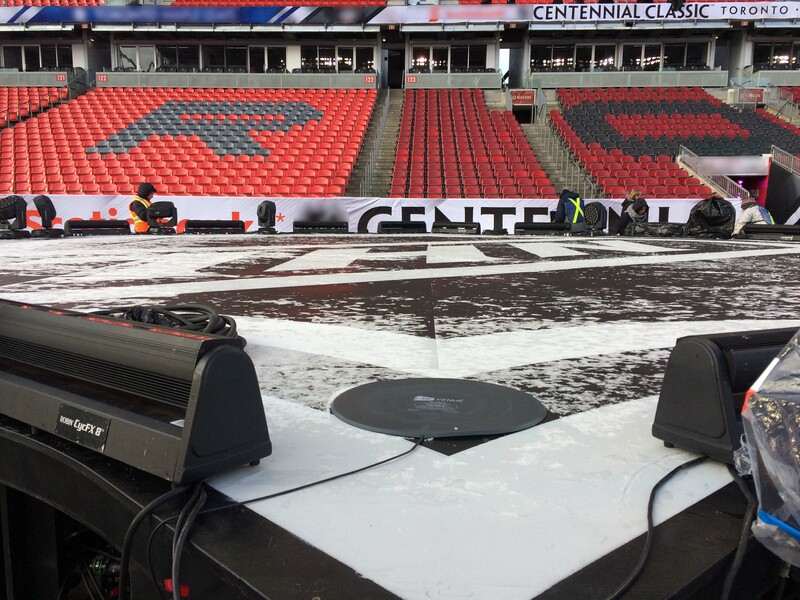 Confused, I asked Ike Zimbel, seasoned RF Coordinator and owner of Zimbel Audio Productions, how he and only one A2, Tony Crea, successfully assayed, databased, calculated, and enforced 302 transmitters from devices of all kinds between 72 MHz and 5.8 GHz at the 2017 Scotiabank NHL Centennial Classic™ on New Year's Day, at BMO field in Toronto. The match brought 40,000 fans. Impressive, when you consider the cold. Here's a time-lapse from the NHL. "First of all, this is Canada," Ike jokes. "And in Canada, we always try and do things with less people. Also, and more importantly, I was extremely fortunate that most of the other A-2’s involved with RF had worked with me before so they were all onboard and fully cooperative”. "The foremost task to being the RF coordinator on a gig like this is coming up with a frequency coordination plan," he says. Above is a screenshot from IAS, which is the culmination of days of hard work to equitably assign and calculate possible intermodulation products from over 300 frequencies to audio, video, and data devices from numerous stakeholders into limited spectrum. Each of the vertical blue lines is a signal—and this is just broadcast white space from 470 MHz - 698 MHz. The second most important task is to "monitor the airwaves to see what's what." By which he means visually identify active signals, ensure the behavior, location, and bandwidth of those signals correlate to the groups and individuals to which they were assigned, and keep an eye out for unauthorized signals. "The third is to get the media credentialed and coordinated as they show up before they're on the field. Because they are the numero uno source of rogue frequencies." 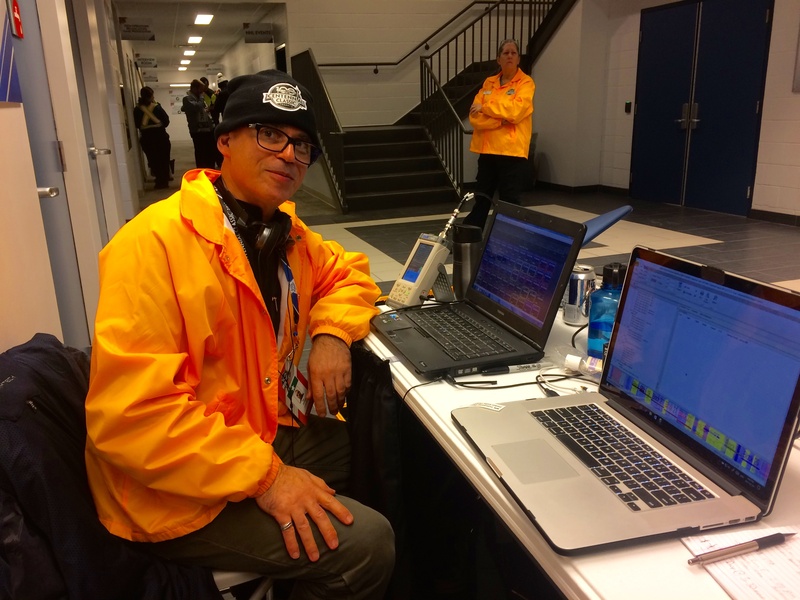 "Getting the various ENG crews from both local and US based media outlets checked in and assigned coordinated frequencies is of primary importance to the NHL," he says. "Because of this, we were stationed in a foyer at the base of the media elevator, on the opposite side of the venue from the arena. 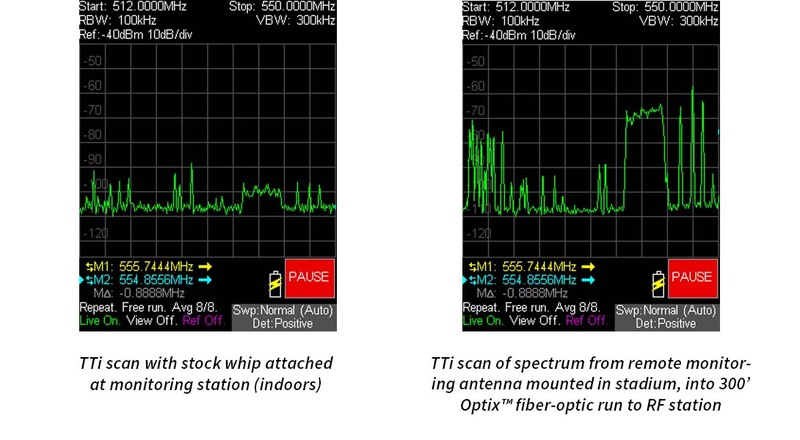 This turned out to be a relatively “dark” area, when it came to seeing radio waves with spectrum analyzers, and that’s where the RF Optix really saved the gig." Using the Optix and a 300’ fiber-optic cable supplied by the venue, Ike was able to place a surveillance antenna on a railing adjacent to the “crow’s nest,” the top level of the venue where the house audio booth and all of the media commentary booths are located. That area was especially tight at the Classic. Along with receive antennas, there were dozens of transmit antennas for IEMs, IFBs, and nine UHF intercom systems. He sent up his A2 to configure the Optix. It took him 10 minutes to set up the antenna, plug in the PSU, and plug in fiber at that end. "Down at my end, we were on the air. I had the ability to scan the spectrum on the field without being on, or even near the field itself." Ideally, a monitoring antenna must see signals emerging from those antennas, but close placement to them causes distortions of spectrum seen by the analyzer. Ike describes how, "every single booth had some kind of RF transmit present, and because our antenna was essentially in parallel with their antennas, I was able to see what the majority of the antennas were seeing”. At the monitoring station, they watch the spectrum using two spectrum analyzers, one the popular TTi, the other an Invisible Waves™ Analyzer from Kaltman Creations, which are connected to the monitoring antenna near the antenna farms at the crow's nest via a single fiber channel. Precise antenna placement allowed a truer and more neutral perspective of RF on the field, instead of RF at the monitoring station, which as these screenshots demonstrate, was severely attenuated. 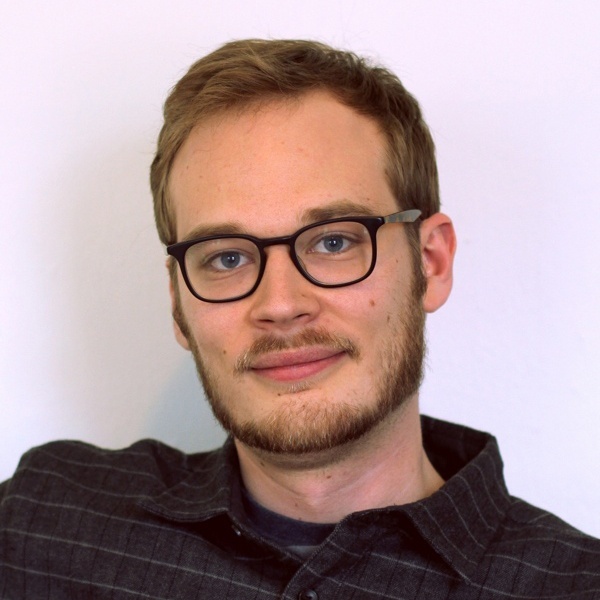 "The Optix absolutely gave me the ability to accurately and authoritatively keep an eye on the spectrum and respond to people's requests," Ike maintains. "Which is good, because if I roll them another frequency it is almost of necessity going to be of lower quality than the one I gave them in the first place." He stresses the functional role of monitoring as one of communication, as much as technical control. "In a coordination where there are 300 frequencies, if somebody comes to me and says, 'Hey, I'm having trouble with this BTR belt-pack frequency, can I get another one?' I say, 'let me go and look at that.' If I look at the spectrum and it's clean as a whistle, then I’ll say, 'I'm not seeing anything there. Can you check other things?' Instead of giving them another frequency. In most cases, those requests evaporated a few minutes later." End-users down on the field, armed with knowledge from the spectrum analyzer that the problem lay somewhere other than in the frequency coordination, or a rogue device, look elsewhere for the source. In one case it was a broken antenna. Another, too much gain on an active antenna (RF Venue Tip: please don't misuse active antennas). Ike also used another RF Venue product, the RF Spotlight antenna as a transmit antenna for the game's first and second period intermission acts. “I chose it for two reasons: 1) the stage was a flat deck between the stands and the rink, so sight lines were a huge issue and 2) with that many transmitters on site, I wanted a way to keep the IEM transmits confined to the stage area as much as possible. It worked like a charm, even with a major act, headliner Bryan Adams”. *All images courtesy Ike Zimbel.